It is a March 2016 manufactured one. Congratulations. Congrats! Please ask your sales advisor to provide the full VIN as Maruti Suzuki's VIN has 21 characters. The last two characters (20 & 21) of the VIN represent the month and year respectively. Congrats! Maruti Suzuki's VIN has 21 characters. Please refer this image from our official review for the location of the VIN. Congrats! The price of the vehicle is applicable as to the delivery date and not based on the vehicle's VIN. MEEVY2L0ND7000023. Its a Renault - Koleos. Congrats! It's July 2013 model. The tenth character 'D' represents the year 2013 and the eleventh character '7' represents the July month. Last edited by Grand Drive : 28th April 2016 at 19:43. Not sure if this is still relevant, as you have already booked your vehicle. As per my understanding, the hikes announced in the budget were applicable immediately- i.e. from 1st March. Mahindra absorbed the hikes only for the booking and deliveries in March. As you are booking now, the new/ increased rate would apply. Hey Thanks. Any way of getting a detailed report? "Prices prevailing at the time of delivery would be applicable!!" Hence you'll be billed the latest pricing and not pre-budget pricing. Thanks. If the 10th and 11th character represent the year and month in this format, mine are GC. That means G= 2016 and C= March, right? Hii thanks for that anurag good to know. Appreciate the information. The last two characters (20 & 21) of the VIN represent the month and the year respectively. If your 20th character is 'C', then it represents the March month and the 21st character 'G' represents the year 2016. 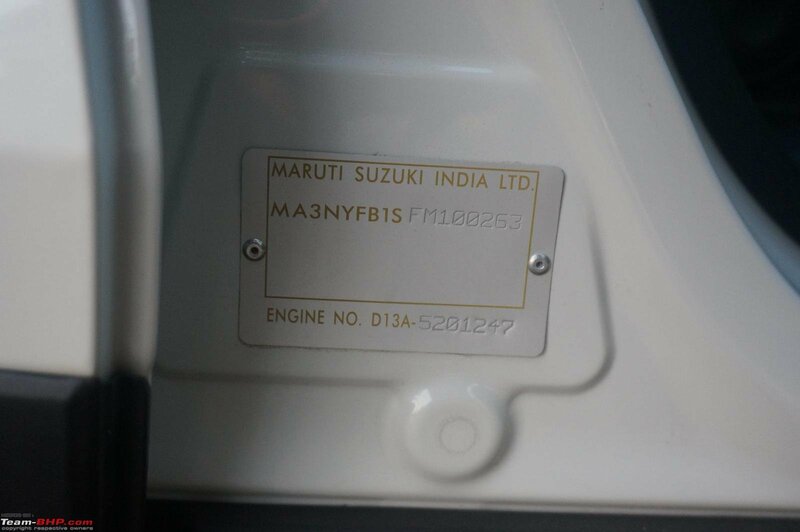 Edit: Maruti Suzuki Brezza's VIN has 17 characters. Are the tenth and eleventh character must be taken for the VIN decode? Please clarify. Last edited by Grand Drive : 28th April 2016 at 22:19. If you see the link you had originally suggested to me*, it has 17 characters, and there are no alphabets at the end but numbers. My Brezza has the same sequence. I was reading somewhere that in such sequences for Maruti, the 10th and 11th characters represent the VIN. Hence my current confusion, i.e. I am not sure at all. Hope this post clears the confusion. Last edited by Grand Drive : 28th April 2016 at 23:43. I'll get back and update you when I pick up my vehicle today. However, in the interim, I am not sure if the information in the link above matches what I am seeing in my Brezza. I did take some pics of my Brezza yesterday and as far as I can see from these pics, even the 'under the bonnet VIN' does not have the 21 characters your link speaks of. Just the $ type special character followed by 17 characters ended by the same $ type special character. Last edited by C'estlavie : 29th April 2016 at 08:22. Hello Guys. Can someone help me with this FORD VIN number? MAJAXXMRKAGR54373. I am confused related to the repeat pattern used by FORD.